Timex – better or worse? Every so often I check out what the latest is at Timex and have they brought out actual new models or rehashes of older ones. The ones I’ve spotted so far are not really what I wanted to see, because they are basically rehashes of older models and not only that, in my opinion they are not real improvements. 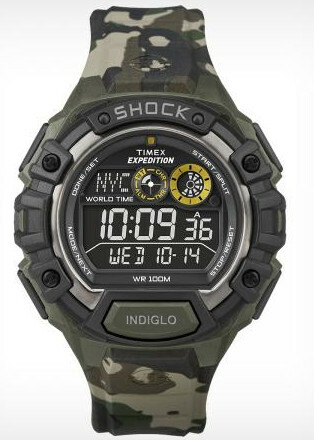 The first one I noticed is a “shock” model and is the Vibration Alarm T49984SU. 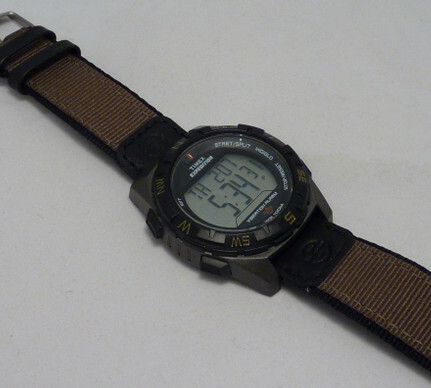 Timex T49950XL Vibration Alarm with bespoke strap. 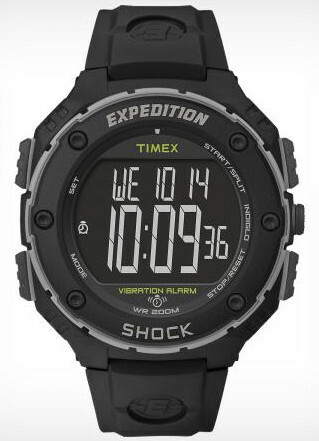 This is basically an update my older Expedition Vibration Alarm Chronograph – Model T49854J but with added “shock” protection. However that added shock protection doesn’t do a great deal for me as the old model was already tough as old boots and function wise they’re very similar with 3 alarms, 3 time zones, chronograph, timer etc etc. and of course the vibration feature, which I have to say is excellent and surprisingly useful on my older model. Older model T49854J Vibration Alarm – Note standard strap & lugs. The downside for me however, stops me even considering purchasing the new model, because even though it increases the Water Resistance from 100m to 200m, it is not as good when it comes to the strap/bracelet arrangement. Once again and disappointingly, Timex have now built-in a bespoke strap arrangement. They’ve narrowed the lugs from the older model, which prevents the use of any standard watch strap and yes you guessed it, you’ll have to buy another one from Timex when it breaks. It might be possible to add a normal strap, but it would be a narrow one to fit the lugs and wouldn’t look so good. So disappointing for me but very glad I got my older model when I did, because it has been excellent in every way. Timex also have a shock World Timer model, the T49971SU which seems impressive with some 62 cities and 30 Time Zones represented and 100m Water resistance. I Like the fact it has 3 quick set Time Zones so you can prepare the watch before travel as it were, which is useful in addition to the full World Time function. The downside for me again is this business of the non standard strap/lug arrangement, narrowed lugs and a bespoke resin strap affair. And whilst a nice watch and a good standard module function set which I expect from Timex, I sometimes have to question and this is not just about Timex, but with any World Time watch, if it’s really necessary. In practical terms Dual or maybe 3 Time Zones to me makes far more sense and rather pointless carrying all the Time Zones of the world around with me. When I went to Brazil via Madrid from the UK, the 3 Time Zones on my old model was perfect. Before I left the UK, I simply keyed in the different times for London, Madrid and Brazil as T1, T2 and T3 – job done. I do like the fact that Timex introduced the concept of 3 settable Time Zones, as this seems to me to be a very practical World Time arrangement, though I wouldn’t be surprised if many Timex owners didn’t realize they had it. Sorry if I’ve rambled a bit and perhaps got off the plot here, but that’s the thing with Timex. They have so many models which appear so similar, confusion rules and you have really got to look very carefully at each model to be able to fit a particular model to your particular likes – and it’s tricky! Indeed I thought – Ha! new models from Timex! – but after checking carefully, I have decided to stick with the ones I have – for now . . . .